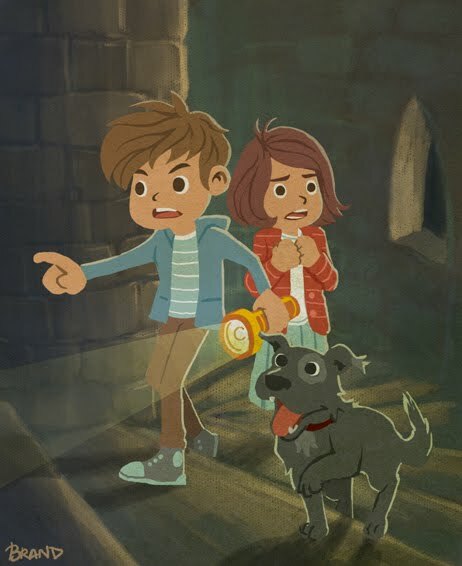 I've always loved stories where a bunch of kids solve mysteries that grown ups weren't able to solve, and get involved in exciting adventures. I have fond memories of The Famous Five tv series from the late 70's. Awesome! Detectives are wicked and yeah those stories are full of adventure! Great illustration! Really like the feel of it, feels like it belongs to a story book! lundi, avril 19, 2010 12:02:00 a.m. I totally agree with you! Enid Blyton was one of my favourite kids authors too. You definitely captured that sense of mystery in your illustration. lundi, avril 19, 2010 7:48:00 a.m.
you bring back memories of my childhood fantasy. lundi, avril 19, 2010 8:59:00 a.m. I agree with Angie, really exciting image and beautifully finished. Love the dogs expression too! lundi, avril 19, 2010 9:00:00 a.m.
Hey Christophe! This is an amazing work! I was entranced by the background (fantastic!) as well as the light and shadows. Your characters are perfect! Full of expression and life. Nice illo! lundi, avril 19, 2010 9:37:00 a.m.
lundi, avril 19, 2010 12:46:00 p.m. Wonderful work on this illo! Great storytelling and expression. Of course the pup had to come along for the adventure - nice touch! lundi, avril 19, 2010 11:34:00 p.m.
That is quite a lot of fun. It get's my imagination going. mardi, avril 20, 2010 2:46:00 a.m. I guess the smartest character is the dog! He may speak. mardi, avril 20, 2010 9:37:00 a.m. Thank you all for your nice words ! mercredi, avril 21, 2010 1:39:00 p.m.
wonderful scenery you put together! Like the lighting a lot! mercredi, avril 21, 2010 4:09:00 p.m.
vendredi, avril 30, 2010 6:17:00 a.m.
Well thank you Mic ;-) I had the song stuck in my head all morning ! dimanche, mai 02, 2010 10:32:00 a.m.